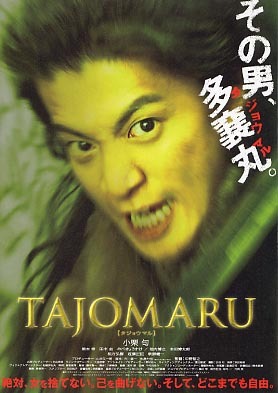 The most interesting thing about the film is the titular figure of Tajomaru. He is a Robin Hood bandit whose legend spans generations, thumbing his nose at the feudal system and inspiring love and hatred. How has he made such an impact? He’s more than one person carrying a legendary blade named Namikimi. More specifically, the title passes from one individual to another through combat: he who kills Tajomaru becomes Tajomaru. It suggests an epic struggle involving generations of bandits killing each other and acquiring the title. None of which you get here as we follow dull characters like Naomitsu. The plot plods along until Tajomaru appears and we get a figure of fun. Like Jack Sparrow from Pirates if the Caribbean he prances around and babbles a lot. His introduction see him dance rings around Naomitsu in an entertaining fight. Then he leaves the film save for a flashback later on and we’re left with the plodding plot and Naomitsu again. Plodding… Everything about the film is solid. Nothing more. The direction adequately captures the bloodless battles, the colourful costumes and the wonderful landscapes. The problem with being merely solid comes into sharper focus when you consider the acting. Everybody runs through the motions. Shun Oguri is underwhelming as a hero, Kei Tanaka as the scheming Sakuramaru is mostly blank-faced until the second half where he resorts to sneering a lot. Yuki Shikamoto, as Ako, manages to be pretty and condescending and vulnerable but only on a surface level. I was never convinced that any actor inhabited their character. Other unexceptional and even distracting elements include the electronic score used throughout the film while the bandits Naomitsu joins all sport modern hairstyles and host impromptu parties with hip-hop free-styling. This could have been cut out to keep the long running time down. It didn’t inspire love or hatred but beyond a few sword fights and the all too brief appearance of the first Tajomaru I can’t see this entertaining people especially with a running time of over two hours.